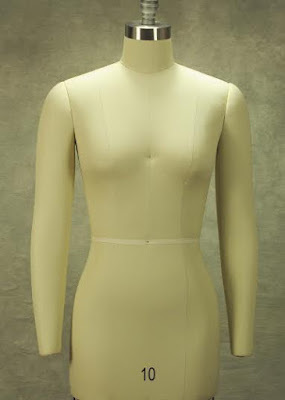 I've recently purchased a new mannequin for photographing my knitting. My previous one (the black one) was showing signs of wear. It was an inexpensive retail display torso. The finial had become very loose and would topple off whenever I moved her. The jersey covering has a couple of pulls, but more importantly she was listing to one side. In the photo there are a couple of coasters under one leg to straighten her out. I spent quite a bit of time researching alternative choices. I was willing to spend more on a replacement but I wanted a much better quality piece, something that would last longer. 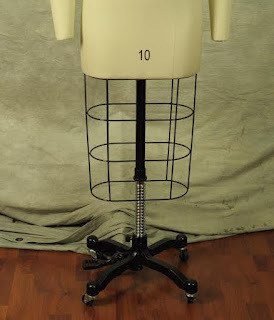 After careful consideration I made the decision to go with a dressmakers or tailor's mannequin instead of choosing another retail display piece. She's perhaps a little plain but more closely imitates a real body. One of the things that bothered me before, was showing shawls on the display piece which had no arms. Even though her bust size was correct in that it is the same as mine, the shawls looked bigger than they do when worn on a real body. She also had an unnaturally tiny waist and hips. 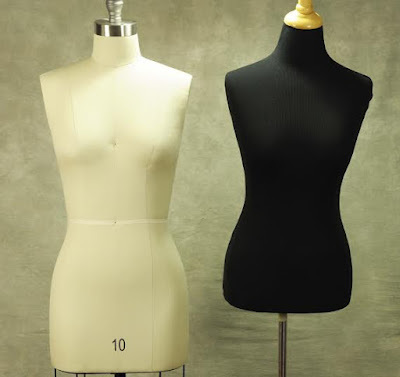 A dressmakers form solves these problems. She has removable arms and a much more realistic size and shape. She's slim but not so unrealistically tiny. She is also easily adjusted up and down by foot pedal. She has a cast iron base, with wheels and is surprisingly heavy. I was aiming for something as close to my size as possible so my samples would be shown to their best advantage. I did have one little surprise after checking measurements and comparing to my own, I picked what I thought was the best size. It turns out that while I do not have thin arms, I do have small arms. When I put the first garment on her the sleeves were snugger than I expected. The chart I used to order her didn't include an arm measurement. The torso, neckline and shoulders are very close to my size but not exactly my shape. I think I'll be deciding whether to use the arms based on each project. We just did photography for two upcoming garment patterns and I went with no arms for one and used them for the second based how how they each individually looked. I haven't published those patterns yet and hope to have the first one done soon. Am very jealous of your new addition, especially with the removable arms! Can't wait to see the pics. Love it!! I have a retail one but really like the look of the dressmakers one that you show. Would you be willing to share where you got it (here or pm on Rav).